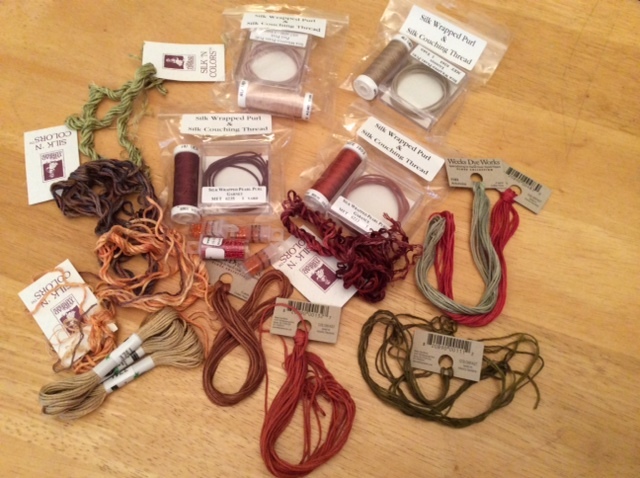 Embellishment Class with Julia Snyder | NJNA is Blogging! 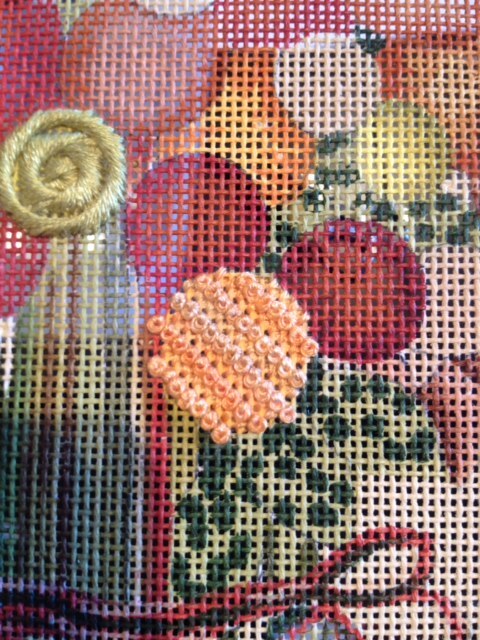 On Friday I had the opportunity to take an embellishment class with Julia Snyder. 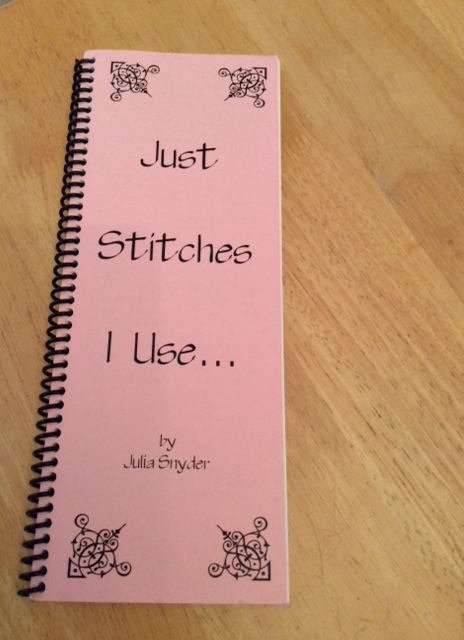 You may know Julia from her wonderful stitch books – Just Stitches I Use, iBargello, and Have Stitch Will Travel to name just a few. 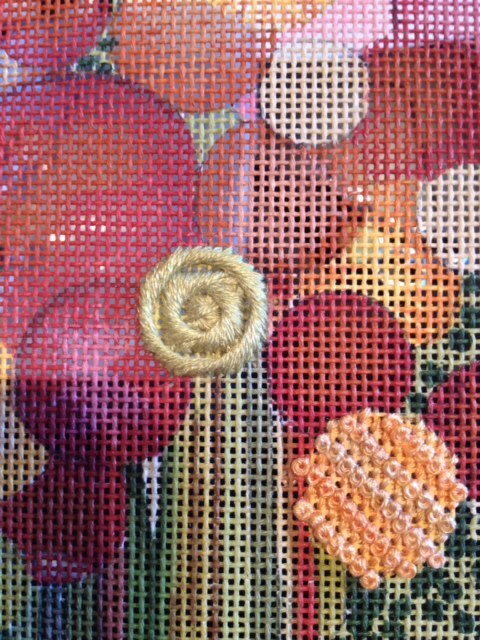 I had been told that taking a class with Julia is not to be missed so I ventured to The Enriched Stitch in Wilton, CT, for this class. I did drive up on Thursday night so that I would not have to contend with Friday morning rush hour traffic between New Jersey and Connecticut. Fortunately there were no major traffic problems and the only slowdown was the last four miles on the Merritt Parkway. I chose a canvas from Ewe and Eye and Friends, Funky Flowers, for this class. I wanted something small since I have so many other projects in the works, yet with enough variety to experiment. The actual design size is about 8″ x 10″ on 12″ x 14″ stretcher bars so it is a nice size. In this class format Julia spends time with each student going over the canvas, discussing the areas that should be emphasized, and selecting threads and stitches. Half the fun of the class is wandering around the shop (which, by the way, has a terrific selection of threads) picking out threads – like a candy store without the calories! As you can see, I have a lot of Weeks Dye Works threads for this canvas. I am also using Silk Wrapped Purl, a new thread for me, for the very light flowers as well as the ribbon around the flower stems. This “thread” is silk wrapped over copper wire so it can be formed into shapes. 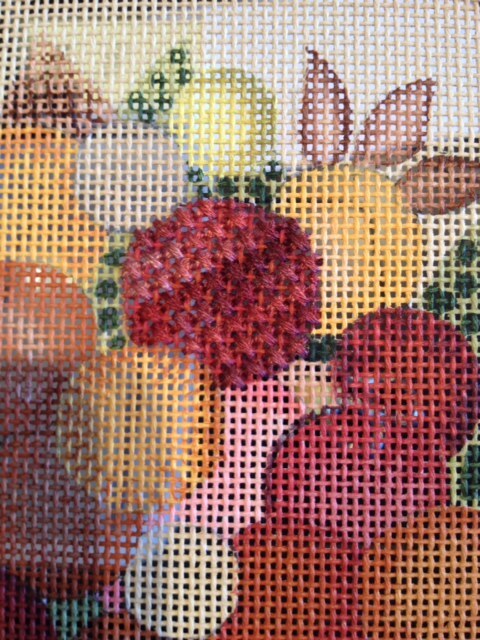 Julia suggested a few new stitches that are just fabulous (at least I think so) for this piece. 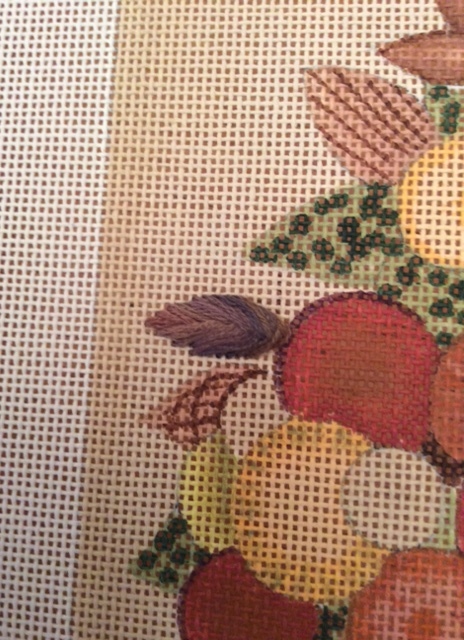 The brown leaves are Raised Closed Herringbone and the light orange flowers are French Basketweave which is a row of basketweave with a row of French knots. 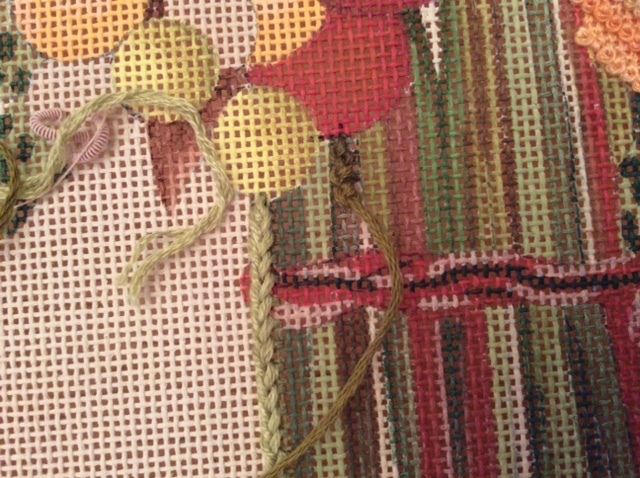 I did not stitch the French knots quite right so I will probably restitch that one flower. 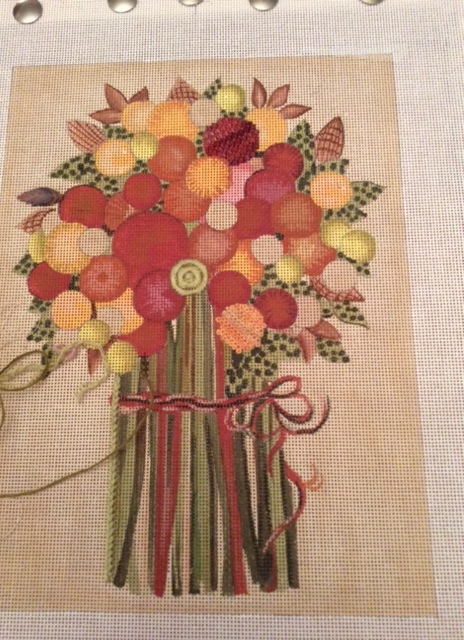 The green flowers are Rhodes Within a Jessica Within a Jessica and the Burnt Orange Flowers are Staggered Crosses. The stems will alternate Palestrina Knot, Peruvian Loop, and Wrapped Chain. There are more stitches for the other flowers but I’ll leave that for another post! So at the end of the class, this is what I had accomplished. The class was thoroughly enjoyable and Julia is a sweetheart with a wealth of knowledge. I would definitely take another class with her if given the opportunity. You can follow her at Have Stitch Will Travel. I did come home with one of her books to add to my library. And, I would be remiss in not saying “Thanks” to Suzie Vallerie and the wonderful women at The Enriched Stitch for hosting and facilitating this class. It was a fun day with a good mix of canvases. I think we all learned so much from Julia and from each other. Linda, I love it. Would you bring it to the meeting on Wednesday, so I can have a better look? I have to come up with flower and scrub ideas for my house canvas. I love the Jessica within a Jessica. 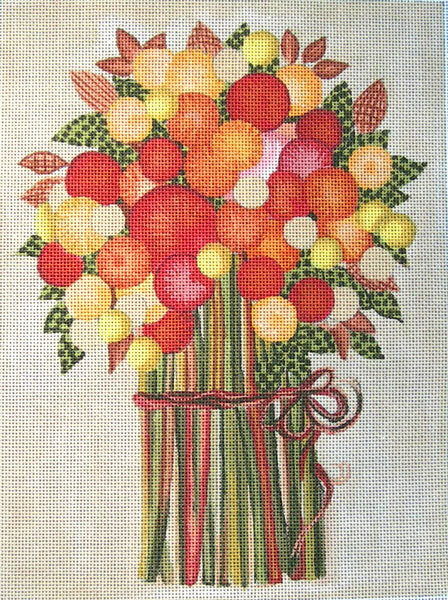 Heidi – I will bring it on Wednesday along with the stitch suggestions.